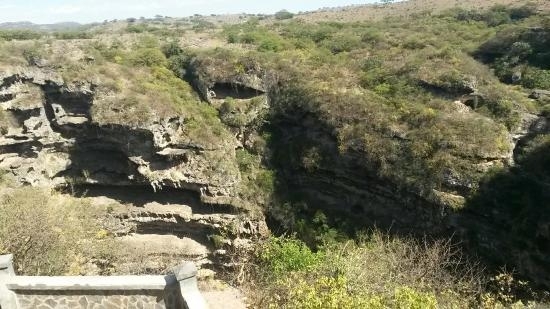 “Tawi Ateer Sinkhole” is the most famous sinkhole in Dhofar governorate known as the ‘Bird Well’ gained international fame after its discovery in 1997 by a team of Slovenian explorers in collaboration with Sultan Qaboos University as one of the largest solvent sinkholes in the world. This adds to the Sultanate's rich biodiversity, its geographical and historical richness, and its historical and archaeological sites, as well as its remains of early civilization, all of which endorses the Governorate of Dhofar as a tourist destination, and boosts the various opportunities for those interested in discovery, along with nature and adventure lovers. The capacity of the Teeq Sinkhole is about 975 thousand cubic metres. Its diameter is between 130 to 150 metres and its depth is 211 metres. Water flowing down the valleys has resulted in the formation of the sinkhole, with its magnificent waterfalls along the intersection with Teeq Sinkhole. In the surroundings of Teeq sinkhole there are several interesting structures, as round collapse dolines, walls around this sinkhole are very slope, and there are wadis enter the sinkhole as very spectacular waterfalls. 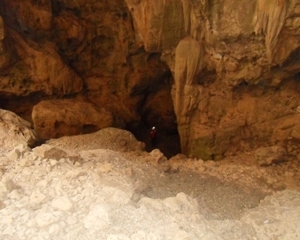 There are two routes to reach this sinkhole site, the first one is to take the mountain route after Taqa (the same that of Wadi Darbat), and the second way is to take a route to Tawi Atair from the Anti-Gravity point. The travelers always take the route of Wadi Darbat (Tawi Atair) and first see the sinkhole and cave. Then head towards the Anti-gravity point. 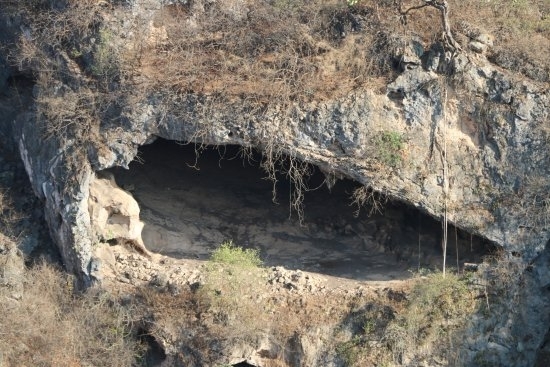 At the bottom of sinkhole there is a continuation, they has been discovered “Teeq Cave” recently, research is ongoing and the results are told to be very impressive and exciting. “Teeq Cave” is near the top of the sinkhole. Its capacity is about 170 thousand cubic meters, and has no less than six entrances, the largest of which is the Western entrance and wall which can be seen from the top of Teeq sinkhole. You can reach that entrance along narrow paths located off the main trail. From those paths you can enjoy panoramic views of the sinkhole and its waterfalls. In 1980 in the lake of sinkhole there was found a new species of fish ws called after one of discoverers; well known researcher of Arabian caves Andy Dunsire: Garra dunsirei Banister. This unique fish lives only in this cave and there are no other freshwater fishes in 600 km radius. In the total darkness of cave fish uses tentacles and other senses, not vision, due to they have very small eyes, but seems to have weak vision. Existence of this fish is important sign, this small fish is relict from the times when the weather in this area was different and there were permanent lakes and streams.